For a glimpse of red-state politics in the era of Donald Trump, look no further than Vice President Mike Pence's home state of Indiana, where a grueling Republican Senate race has been dubbed the nation's nastiest primary. Two sitting congressmen and a former state lawmaker are locked in tight competition for a chance to unseat Democrat Joe Donnelly in November. They've tried to appeal to Trump voters by adopting the president's harsh immigration rhetoric and penchant for personal insults. The candidates have even channeled Trump by assigning derisive nicknames to one another: "Lyin'" Todd Rokita, Luke "Missing" Messer and "Tax Hike" Mike Braun. But as the bitter campaign slogs on, some Republicans worry the winner of the May 8 primary could emerge so wounded it could risk the party's chances of taking down one of the Senate's most vulnerable Democrats. "This race has slowly but surely descended into Dante's Inferno," said John Hammond III, who represents Indiana on the Republican National Committee. "It will provide the Democrats an awful lot of free opposition research." Rollicking debates have taken on a reality-TV aura as the candidates have torn into one another. Out-of-state living arrangements, questionable uses of tax dollars, drunken-driving convictions, voting histories and ethical transgressions — all dredged up in news stories — have provided grist for the attacks. Rokita likens it to a "cleansing process." But with few major policy differences, they don't have much else to contrast. "It's a continued race to the bottom," Indiana Democratic Party Chairman John Zody said. "These guys are so alike on policy that the only way they can differentiate themselves is by attacking each other." Indiana is among a handful of states — including West Virginia, Wisconsin and Virginia — where similarly harsh words have been used recently for political gain. Pence ran a series of failed negative campaigns early in his political career, even penning an essay entitled "Confessions of a Negative Campaigner." But long ago, he swore off such tactics and has called for civility in politics. When it comes to the Indiana GOP race, the vice president hasn't just been civil; he's been silent. He canceled a political rally that had been scheduled for Thursday in the Indianapolis area and rescheduled it for mid-May — after the primary is over. Democrats, meanwhile, have egged on Republicans, hoping any damage they inflict will help Donnelly, who has spent recent months fundraising and flying under the radar. Throughout, the GOP candidates have fallen over each other to profess their admiration for Trump, who won the state by 19 points. Rokita, a three-term congressman, dons a red "Make America Great Again" hat in TV ads and carries a cardboard Trump cutout to rallies. Messer, who is in House leadership, recently suggested Trump ought to win the Nobel Peace Prize. And Braun, a businessman and former state lawmaker, argues his experience makes him even more Trumpian because he's an outsider. Yet prior to the president's election, Rokita and Messer spoke harshly of then-candidate Trump. Braun, on the other hand, has a long history of voting in Democratic primaries — including 2008, when Hillary Clinton and Barack Obama were on the ballot. Before either Messer or Rokita formally entered the race last summer, the former Wabash College classmates were already exchanging blows. That came after Rokita seized on a story by The Associated Press revealing that Messer's wife earned $240,000 a year from an Indianapolis suburb for part-time legal work she did from home in Virginia. The report also noted that the Messers no longer owned a house in Indiana and that the congressman was using a two-bedroom home he co-owned with his mom as his in-state residence. 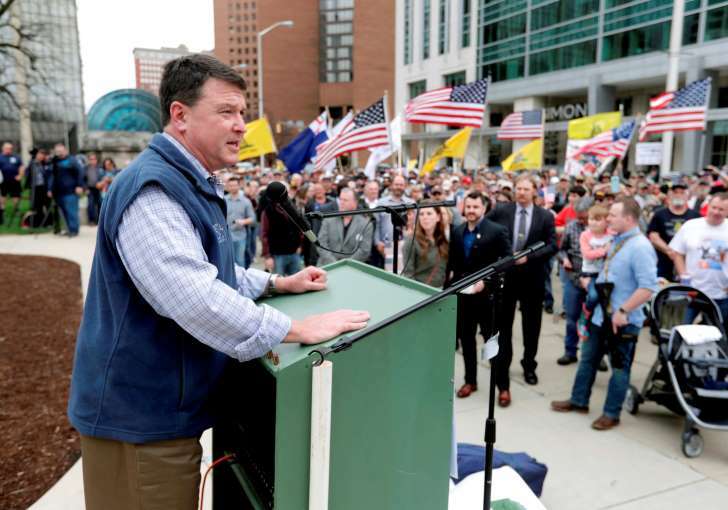 His out-of-state living situation led Rokita to label him "Missing Messer." Messer responded by accusing Rokita of "lying about my family" and eventually branded him "Lyin' Todd," a riff on Trump's "Lyin' Ted" nickname for Texas Sen. Ted Cruz. "I've known him since he was 19," Messer told the Lafayette Journal and Courier. "I know how he behaves." Braun, who is independently wealthy, jumped in the race in August citing the divisive tone and his ability to self-finance. Quickly, he too joined in the attacks, labeling Rokita and Messer the "swamp brothers. " But Braun also has made some rookie mistakes. He briefly employed a campaign aide with ties to the White Nationalist movement. Later, an anti-immigration TV ad he ran was condemned by the widow of an Uber driver for politicizing the death of her husband, who was killed alongside Indianapolis Colts player Edwin Jackson in a suspected drunken-driving crash involving a Guatemalan man in the country illegally. Then there's his 2017 vote in the Legislature to increase Indiana fuel taxes by a dime a gallon, which led to the moniker "Tax Hike Mike." While Pence has stayed out of the fray, the president's re-election campaign weighed in last week on the parochial matter of yard signage, demanding that Rokita take down signs it felt falsely implied he was endorsed by Trump and Pence. That came on the heels of an unearthed 2016 interview in which Rokita — who has sought to position himself as the most pro-Trump candidate in the race — called the eventual president "vulgar, if not profane." Former staffers also have reported that Rokita fostered a hostile work environment. They say he has berated staffers to tears, docked pay for minor mistakes and forced them to undertake demeaning tasks, like cleaning his car after a campaign driver had body odor. He also drew scrutiny for spending $3 million in public money on self-promotion, and for doing political work on government time as Indiana's secretary of state — a likely ethics violation. Negativity in a primary can cut both ways, said Mike Murphy, a GOP communications consultant and former Indiana state lawmaker. On one hand, it can give Donnelly plenty of fodder for the general election. But he added that "bringing out all the bad news in March and April is better than bringing it out in September and October."